Sizes: approx. 1.299 x 3.267 inch (ca. 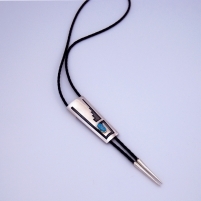 33 x 83 mm) slide; 0.157 inch (4 mm) diamater cord, 18.5 inch (47 cm) long. 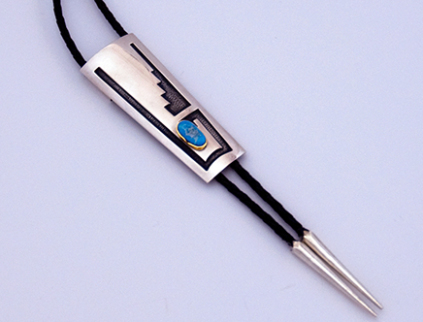 This elegantly designed bolo tie, handcrafted by Zhaawano Giizhik, has an abstract, stylized design that's inspired by the Hopituh Sinom, or Hopi People, from northeastern Arizona and their beautiful ceremonial songs. 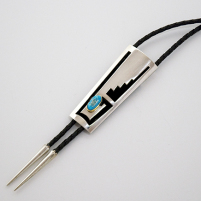 The title of the bolo tie, biidaanakwad, is a word from Anishinaabemowin (the Ojibwe language) meaning "Hither Flying Cloud," - literally: "A Cloud Approaches." Both title and design reflect the connection that Native Peoples know exists between the plant world and Grandfather Thunder. Now for bean-blooms we wrestle. Upward may help one another to grow."